I've updated my Flickr pages with some new art -- a mini book, "Fly Free," some Zentangle-inspired doodles, miscellaneous "stuff" that I wanted to share. Visit my Flickr pages and see what is new. Yesterday, just about twilight, we had a visit by our "resident" black bear. I was sitting on the porch, reading, when I became aware of more noise than usual in the woods, just 50 or so feet from where I sat. It took a while to register, because the cicadas were in great form, as they have been for a while and twilight seems to be their signal to start up. The noise in the forest grew louder, the sounds of breaking branches, loud thumpings, and then snorting and snuffling noises -- and coming closer.. The cat that had been sitting by my feet jumped up and ran indoors, hissing. I followed, not hissing, but very curious. My second cat ran up the stairs and into the bedroom, jumped up on the table under the window and flattened himself on the table so that only his eyes were above the window sill. I had never seen him behave that way before; he is nearly 14 years old and is generally calm and pretty laid back. All at once, I spotted him: the bear! And in a terrible temper! He continued to roar, breaking branches, scuffing up the forest floor and snorting/snuffing/growling in between roars. After a few minutes, he continued along his way, still upset and letting everyone in the area know about it. He looked unhurt, just angry. About midnight, I heard a large animal moving though the woods again. I suspect it was the bear, but this time, there was no roaring or growling. Just his normal "snuffling around, checking things out and looking for food" nightly wanderings. And suddenly, I wondered -- it is mating season for bears? Steampunk Book #2 - Front, a photo by VTpicturesPPP on Flickr. 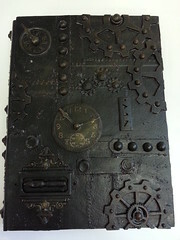 Here is a second Steampunk book, this one uses modeling/molding paste on a paper mache book base. Three layers of acrylic paint, finger-painted on, make it look like real wood. See more on my Flickr page. Steampunk Book #1 - Front, a photo by VTpicturesPPP on Flickr. 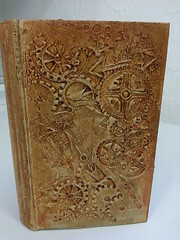 I had a great time making this Steampunk book, starting with a blank wooden book box. Both front and back, as well as the spine, are decorated. There is a hidden drawer at the book's spine. Visit my Flickr page for other views. We've had a wet summer here this year. 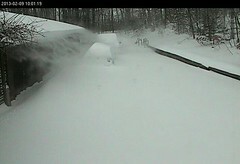 So many days have had stormy weather that I've lost count. 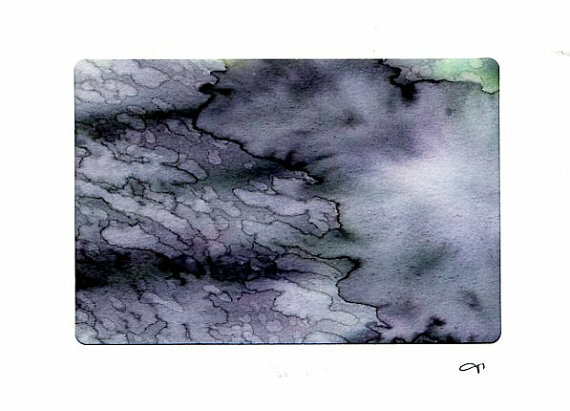 The rain on my studio window inspired this little watercolor painting, now a card. I've been really busy today, adding dozens of solid pewter beads and some new hand-dyed silk ribbons to my ETSY shop, Bertseesabox. Whew! Ironing ribbon for hours in the heat makes me wilt. Time to stop and call it a day. Get 15% off at the Etsy shop between Aug 5-25. Enter the coupon code 15OFFINAUG at checkout. Be sure to use the code exactly as shown here, all caps and no spaces, for the discount to take effect.